Everything about Mutant Mudds Deluxe, the latest game from Renegade Kid, screams “retro”. The delightfully pixelated graphics, the pitch-perfect chiptune soundtrack and the old school platforming gameplay all look, sound and feel familiar. Yet Mutant Mudds Deluxe is so well-refined that it can hold its own against some of the classics that it is so clearly inspired by. Originally a Nintendo eShop release, this “12-bit” title stands out thanks to its unique three-plane approach. While the core of the game still revolves around the traditional 2D side-scrolling format, the main protagonist, a courageous young fellow named Max, can leap from one layer to the next. 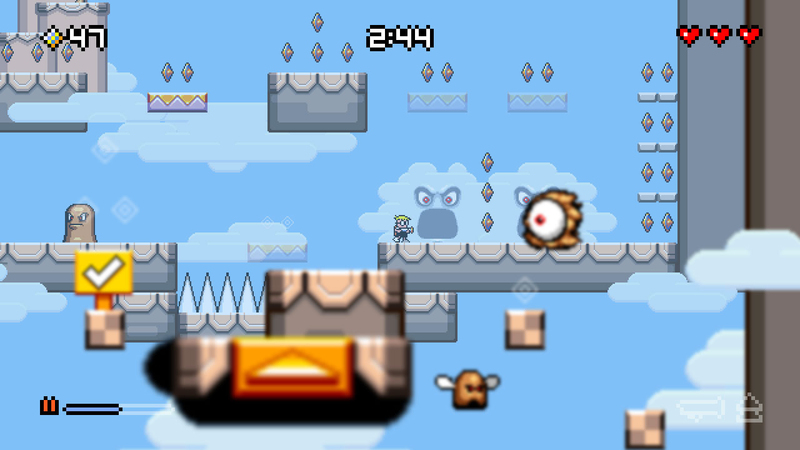 Through jump points scattered within each level, Max can maneuever between the foreground and background of the screen. Each layer has its own items and enemies, making this type of inter-dimensional traveling critical to maxing out each area. Since this is the deluxe edition, there are a whopping 80 levels included. Each level has exactly 100 objects to collect, as well as a four-minute time limit. The objects in turn are used as a form of currency in order to get new upgrades for Max. Originally armed with just a meager water gun and a short-burst jetpack, he can eventually acquire additions that allow for increased capacities for both. The best upgrade, however, is the ability to perform super jumps, which makes it a bit easier to maneuver past tricky enemies and/or spike deathtraps. Each level requires strong dexterity and a bit of patience. Max doesn’t handle as fast as most platforming characters, so his jumping and floating need to be especially well-timed. There are a plethora of evil enemies out there, including some who cannot be wiped out by Max’s water gun. As the levels progress, so do their difficulties; many of the later ones pack quite the challenge. Thankfully, each level does contain a checkpoint, making the frequent deaths somewhat less painful. For all of the masochists out there, rest easy: there is an option to get rid of the checkpoints as well. The levels are all brilliantly designed, and each one has an alternate path that can only be found by using specific upgrades. There’s also a particularly challenging batch of ghost levels with unhittable enemies that can be unlocked over time. There is no shortage of content here — you’ll certainly get your money’s worth for $9.99. Every now and then I get the itch to play an old school platformer, and Mutant Mudds Deluxe absolutely satisfied this desire. This version has the advantage of being a cross-buy and cross-save title, but I found it to work best in short bursts on the PS Vita. No matter which platform you prefer, this is a top-notch throwback to the challenging days of yore.